1: A succession model to the type-D20 which had an overwhelming success in winning the domestic FF races. 2: The 20% more discs then the previous model generate the maximum torque delivery & capacity and superb durability. 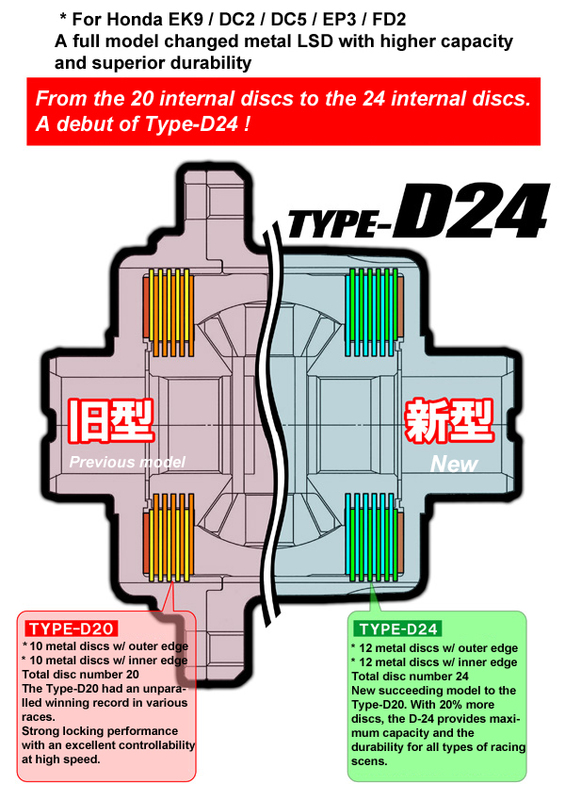 The previous model used the 20 internal discs and the Type-D24 has 24 internal discs. 3: The disc used is the S-type (same as the previous model) which provides an excellent throttle response and controllability. 4: A right choice for the very hard racing environment for the FF vehicles with slick tires. 5: The newly designed LSD case is made of heat treated forged chromoly (chromium molybdenum steel) for the outstanding strength. 6: Ample optional & spare parts are available for the excellent adjustability. 7: Outstanding choice for the endurance race, racing with slick tires, and competitions. Note: The side bearing for the DC5 (91005-PPS-003) is required for DC2 and EK9.